N.E.L Metal Restorations has a full in-house repair department which includes welding of all metals and zinc die casting. We also have a full disassembly and reassembly department with the capability to make custom rivets and fasteners to suit your needs. 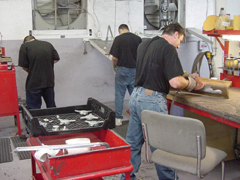 Our polishing department is second to none, with the most up-to-date tooling and equipment available, allowing us to restore parts to their original detail. Our recently upgrade plating operation--with counterflow rinse systems; high-pressure, low-volume rinse areas; and the finest filtration system in the industry, allows us to create the finest macro finishing which truly separates us from most other stqandard plating shops. Call us to experience the difference between professional and novice metal restorations! With Precision Chrome, you will get the most professional service and the best results. Our expert technicians are sure to exceed your expectations.